A quick Google search for “esthetics” will turn up results for both “esthetician” and “aesthetician.” Admittedly, this can be confusing to many who are unfamiliar with the territory. Merriam-Webster, a popular online destination for word meanings (aka the online dictionary) defines esthetician as the more common spelling, and with the “a,” the less common of the two. HOWEVER, the “a” version does happen to be the more popular spelling across the pond and throughout Europe. Find a medical esthetician program near you! They are the professionals who work in med spas, plastic surgery and dermatologist offices, and other medical facilities to help their clients’ skin appear the best it possibly can. They are skin therapists who work with people with skin damage due to serious illness, trauma, or accidents. They also take care of patients with sun damage, discoloration, or any other issue affecting the look of their skin. In many circumstances, medical estheticians have been responsible for helping their patients gain back the confidence they once had, pre skin issue. Learn more about becoming an esthetician. The difference between a regular esthetician and medical esthetician is the type of clients they work with as well as where they work. In many states, it is illegal to call yourself a medical esthetician. The title alludes to the fallacy that you’re permitted to provide medical care, and that is not the case. If you are administering injectables such as Botox, they need to be done under the supervision of a physician—it’s a toxin, and therefore considered a medical procedure. You could be at risk for losing your license if you’re doing procedures only physicians can do. Although the career is called medical esthetician, it is not considered part of the medical field. It’s part of the beauty industry that works within the medical industry. What is a Paramedical Esthetician? Medical estheticians work with Botox, chemical peels, cosmetic fillers, lasers, electrolysis, and other emerging technologies specific to the field. They may also teach patients how to apply makeup to cover up any skin issues they may have, from severe burns and scarring to pigment discoloration. Medical estheticians are passionate about helping others to rebuild their appearance in whatever capacity is necessary. To get into cosmetology school, you’ll first need a high school diploma or GED. Many cosmetology programs have two tracks: cosmetology and esthetics. You’ll do esthetics. You can pick a cosmetology school or a community college: both are perfectly acceptable choices. There isn’t a specific path set to become a medical esthetician, but many students choose to take college science courses to add to their knowledge base. Find a Medical esthetician program. The average esthetician program lasts 600 hours (or 4-12 months), but each state has its own requirement when it comes to course hours. Much of the medical part of the career is learned by extensive on-the-job training. Some states offer an advance training, called a Master Esthetician, which is up to an additional 1,200 hours. To stay up to date with industry trends, it’s important to join organizations such as the National Coalition of Estheticians, Manufacturers/Distributors & Associations (NCEA). Careers in the beauty industry, including estheticians, have continuing education units (CEUs) they must complete. Every state is different when it comes to how many credits are actually required. 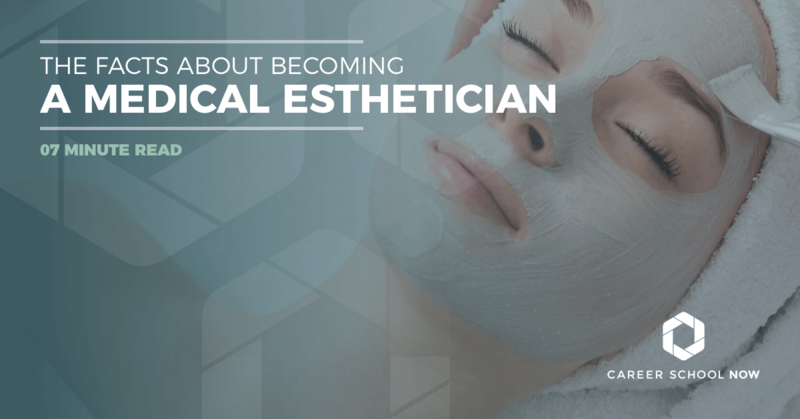 Becoming a licensed esthetician doesn’t mean you’re going to be working for someone else. That’s just one of a variety of choices you’ll have. However, there are many other career paths you can follow once you’ve finished your training, passed the state boards, and become an esthetician. Maybe you can add makeup artist to your job description, as well! Do I Need an Esthetician License? Medical estheticians are considered personal care workers, which means that licensing is mandatory. However, each state has its own requirements. The license will allow you to work in all facilities employing medical estheticians or any other type of personal care worker. Once you complete your accredited cosmetology esthetician program, you’ll take a written and practical exam to prove you learned and retained all the necessary information in accordance with your state’s rules and regulations. You can take a free practice test here. If you think about it, many jobs have sort of a salesy aspect to it. An esthetician is no different. So, if you’re to succeed in this competitive industry, where there are medspas on every corner, then you need to have the personal qualities to back up your super skin skills. Customer service: Maybe you call them clients or patients, or perhaps you view them as customers. Whatever the term, they are paying you for a service that will make them feel better about themselves. Your personality needs to shine and accommodate even the fussiest of consumers. Business acumen: Even if you’re working as an employee at a spa, you’ll still want to behave as if you’re running your own business within a business. Therefore, it’s important to have a basic working knowledge of running a business, from scheduling to accounting to management. Initiative: You need a “go out and get ‘em” attitude, especially when you’re just starting your career. Clients probably won’t swarm to you at first, so you need to network and be in places potential clients are hanging out. Stamina: Both physical and emotional stamina are needed for this career choice. You’re working with people, many of whom have debilitating conditions. It can have an effect on you. Also, you’ll be standing and working with your arms and hands for most of the day, which sets you up for tired and achy arms and legs. Endurance needed! Most skincare professionals earn an hourly salary as opposed to an annual one. The Bureau of Labor Statistics states that the median hourly salary is $14.46. However, it could be a different scenario state by state and by employing facility. The top 10 percent of estheticians and medical estheticians earn almost $29 per hour. A 13 percent employment growth is expected for estheticians through the next few years. The average is 4-6 percent, so this growth is much higher than the median. Because people are taking better care of themselves and their appearance, you can expect to find many career opportunities. Hey, in the age of the selfie, people will stand in line for a great Botox treatment. So, whether you call yourself a medical esthetician, paramedical esthetician, or just plain fantastic esthetician, you are focused on your clients, their skin, and helping them feel better about themselves. Isn’t that what life as an esthetician is all about?